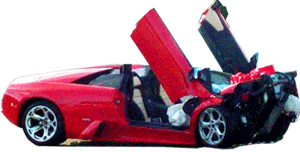 28 year old groom lost control of this rented Lamborghini on the way to his wedding. Ended up losing his $15,000 insurance deposit. Lamborghini Gallardo. Happened in Sydney, Australia.